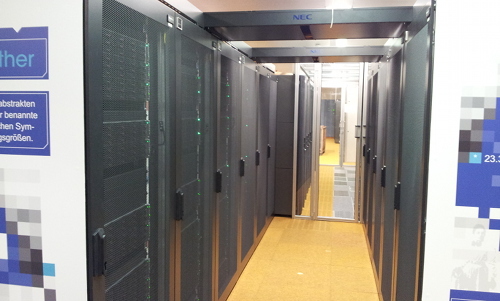 RRZE’s Emmy cluster (NEC) is a high-performance compute resource with high speed interconnect. It is intended for distributed-memory (MPI) or hybrid parallel programs with medium to high communication requirements. 2 front end nodes with the same CPUs as the nodes. 16 Nvidia K20 GPGPUs spread over 10 compute nodes. overall peak performance of ca. 234 TFlop/s (191 TFlop/s LINPACK, using only the CPUs). 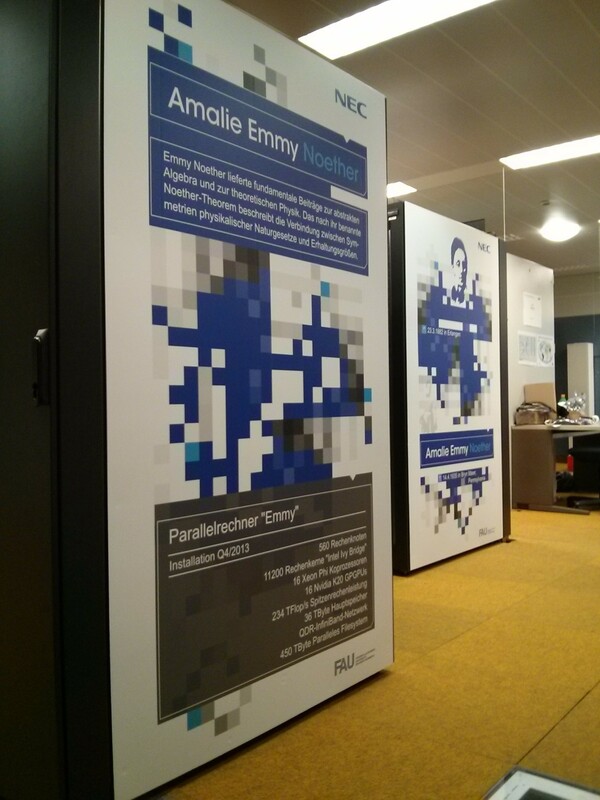 The Emmy cluster is named after famous mathematician Emmy Noether who was born here in Erlangen. Emmy is a system that is designed for running parallel programs using significantly more than one node. Jobs with less than one node are not supported by RRZE. Users can connect to emmy.rrze.fau.de by SSH and will be randomly routed to one of the two front ends. All systems in the cluster, including the front ends, have private IP addresses in the 10.28.8.0/22 range. Thus they can only be accessed directly from within the FAU networks. If you need access from outside of FAU, you have to connect for example to the dialog server cshpc.rrze.fau.de first and then ssh to emmy from there. While it is possible to ssh directly to a compute node, a user is only allowed to do this while they have a batch job running there. When all batch jobs of a user on a node have ended, all of their processes, including any open shells, will be killed automatically. The shell for all users on Emmy is always bash. This is different from our other clusters and the rest of RRZE, where the shell used to be tcsh unless you had requested it to be changed. The following table summarizes the available file systems and their features. It is only an excerpt from the description of the HPC file systems. The nodes do not have any local hard disc drives like on previous clusters. Exception: The GPU nodes. When connecting to one of the front end nodes, you’ll find yourself in your regular RRZE $HOME directory (/home/hpc/...). There are relatively tight quotas there, so it will most probably be too small for the inputs/outputs of your jobs. It however does offer a lot of nice features, like fine grained snapshots, so use it for „important“ stuff, e.g. your job scripts, or the source code of the program you’re working on. See the HPC file systems page for a more detailed description of the features. The cluster’s parallel file system is mounted on all nodes under /elxfs/$GROUP/$USER/ and available via the $FASTTMP environment variable. It supports parallel I/O using the MPI-I/O functions and can be accessed with an aggregate bandwidth of >7000 MBytes/sec (and even much larger if caching effects can be used). Note that parallel filesystems generally are not made for handling large amounts of small files. This is by design: Parallel filesystems achieve their amazing speed by writing to multiple different servers at the same time. However, they do that in blocks, in our case 1 MB. That means that for a file that is smaller than 1 MB, only one server will ever be used, so the parallel filesystem can never be faster than a traditional NFS server – on the contrary: due to larger overhead, it will generally be slower. 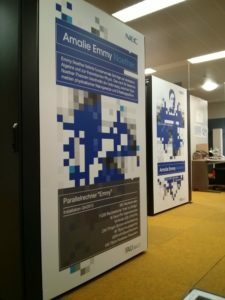 They can only show their strengths with files that are at least a few megabytes in size, and excel if very large files are written by many nodes simultaneously (e.g. checkpointing). For that reason, we have set a limit on the number of files you can store there. big 01:00:01 – 24:00:00 1 – 560 special users Not active all the time as it causes quite some waste. Users can get access for benchmarking or after proving they can really make use of more than 64 nodes with their codes. As full nodes have to be requested, you always need to specify -l nodes=<nnn>:ppn=40 on qsub. All nodes have properties that you can use to request nodes of a certain type. This is mostly needed to request one of the GPU nodes. You request nodes with a certain property by appending :property to your request, e.g. -l nodes=<nnn>:ppn=40:ddr1600. Note about the Xeon Phi cards: Intel has completely lost interest in these old generation cards, and no longer supports them in new compiler versions. They also no longer provide updates for the software stack needed to run the cards, which means that we could no longer install any security updates if we wanted to keep on supporting these cards. Thus, as of October 2017, these cards can no longer be used on Emmy. The nodes housing them have been repurposed for running applications that need graphics- or other large libraries and can not be run on the normal compute nodes because those are not installed there. Properties can also be used to request a certain CPU clock frequency. This is not something you will usually want to do, but it can be used for certain kinds of benchmarking. Note that you cannot make the CPUs go any faster, only slower, as the default already is the turbo mode, which makes the CPU clock as fast as it can (up to 2.6 GHz) without exceeding its thermal or power budget. So please do not use any of the following options unless you know what you’re doing. The available options are: :noturbo to disable Turbo Mode, :f2.2 to request 2.2 GHz (this is equivalent to :noturbo), :f2.1 to request 2.1 GHz, and so on in 0.1 GHz steps down to :f1.2 to request 1.2 GHz. To request access to the hardware performance counters (i.e. to use likwid-perfctr), you have to add the property :likwid. Otherwise you will get the error message Access to performance monitoring registers locked from likwid-perfctr. The property is not required (and should also not be used) for other parts of the LIKWID suite, e.g. it is not required for likwid-pin. Intel MPI is recommended, but OpenMPI is available, too. For more details on running MPI parallel applications, please refer to the documentation on parallel computing. Intel’s ark lists some technical details about the Xeon E5-2660 v2 processor. change even if the load on the backbone links changes, it is possible to generate traffic patterns that will cause congestion on individual links. This is however not likely to happen on normal user jobs.